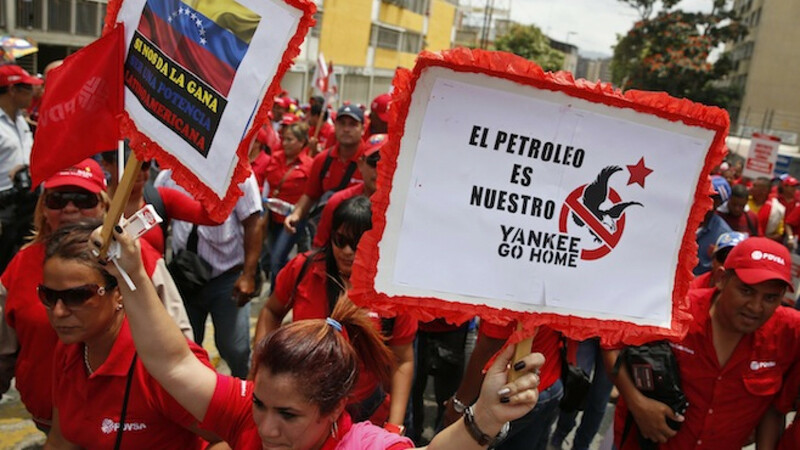 Workers of a state-run oil company take part in a rally against imperialism in Caracas, Venezuela. Russia has been holding active, "unprecedented" consultations with the Organization of Petroleum Exporting Countries, a senior official said on Wednesday, a clear signal of Moscow's strive for higher oil prices. Russia, one of the world's top oil producers, expects its economy to shrink by 3 percent this year, following an almost 50 percent drop in oil prices since their $115 per barrel peak in last June. The fall in price of oil, which together with natural gas account for over a half of Russia's state budget revenue, has been compounded by a refusal by OPEC and its kingpin Saudi Arabia to cut output. "The Russian Energy Ministry has been in consultations with OPEC and Latin America countries, the recent consultations have been unprecedentedly active. This work should continue," Deputy Prime Minister Arkady Dvorkovich told a meeting at the Energy Ministry. Alexander Novak, Russia's energy minister, told reporters he had spoken to OPEC Secretary General Abdullah al-Badri several days ago. "On the whole, we are in a dialogue, it has been formalized. As you know, we meet twice a year, discuss the perspectives for oil market development. We discuss various issues, local [issues], the ones which relate to shale oil production, oil refining, tax changes in different countries," he said. But an OPEC delegate from a Gulf oil producer poured cold water on Moscow's statements on cooperation. "The Russian comment does not mean a joint cut in production it just means that there is concern over price, but in the end, there might be no action taken," the official said. Last month, Russia's Novak said he would meet OPEC in June to discuss the impact of shale oil on global markets, days before the group decides whether its policy of high output is sufficient to stifle the U.S. energy boom. Saudi state news agency SPA reported on Tuesday that Saudi Arabian oil minister Ali al-Naimi discussed oil markets with Russia's ambassador to Riyadh, Oleg Ozerov.